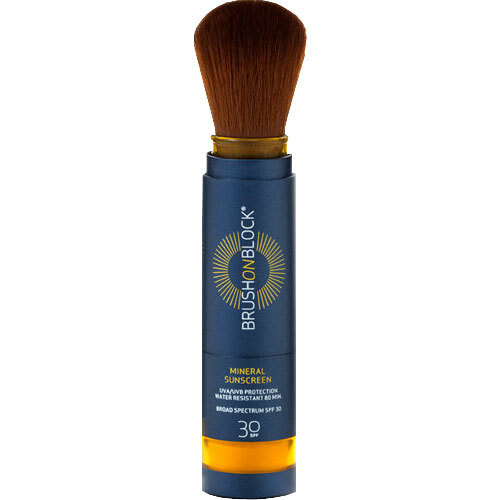 Brush On Block is a broad spectrum SPF 30 mineral powder sunscreen with no chemical sunscreen ingredients. Mineral powder sunscreen is dispensed through our ultra-soft premium brush hairs. Buff liberally over face, neck, arms, hands and scalp for full coverage. Synthetic brush hairs are cruelty free. Self-dispensing brush is easy to carry - toss into your handbag, sports bag or glove box for everyday sun protection. TSA-friendly and refillable. Finely milled minerals offer natural sunscreen actives titanium dioxide and zinc oxide, along with soothing and enriching botanicals and antioxidants to enrich, soothe and replenish your skin. Housed in a refillable powder cartridge, the minerals offer full spectrum protection from UVA, UVB and IRA rays.